Castle isn’t a show that has to get everything right. I know, this sounds like a ridiculous statement, but just hear me out. A great deal of the enjoyment of Castle is not because of meticulously crafted and plotted cases, but instead the meticulously developed camaraderie and chemistry between the main cast. If the case of the week skips a few steps in nabbing the bad guy to allow the time for more banter between the leads, well, that’s usually just fine by me. This fun cast chemistry gets a chance to shine in the lighter episodes, which make up the bulk of the series. A few times a season, though, Castle digs deep and aims for something more, with varying results. “Kill Shot,” which goes deadly serious to deal with the specter of Beckett’s shooting, doesn’t get everything right but gets damn close. And in this case, damn close ends up being pretty damn good. Pulling the audience through and making everything in the episode work was Stana Katic. Katic is an actress who has grown tremendously since the show began, and all of that growth was evident tonight. She was fantastic from beginning to end. She really has to work extra hard to make it believable, since basically the entire arc for her PTSD has to come within one episode. It’s not a small task, and she takes what the script gives her and runs with it. She even manages to somewhat sell the confrontation speech where she attempts to talk down the sniper, which is honestly pretty ridiculous on its face. Beyond Katic, the episode was encouraging for the character of Beckett, with her admitting the desire to move on from her mother’s death and finally live her life. This has implications for her and Castle’s relationship, but also for the long-term arc of the series. Without her mother’s case to drive her, who is Kate Beckett? And what will she do if confronted with the possibility to know the truth? It’s exciting to have the potential of such character evolution in a genre where the characters so often stay the same. Also getting a chance to shine was Jon Huertas. The “other two” cops rarely get a chance to do anything interesting, and tonight proves what a shame this is. Esposito is not a very developed character—if you asked me before tonight one defining characteristic about him I would say “he slept with the medical examiner”—but tonight proved that when asked, he can do so much more. It’s interesting the show decided to almost completely remove Castle from Beckett’s evolution here, considering how important their relationship is to the show, but Esposito’s involvement proved there are other character combinations here that work. The scene where he forces her to confront the gun from her shooting and recognize it for the hunk of metal it is was surprisingly moving, and it was fitting he would be Beckett’s hero in the end this time by taking out the suspect. 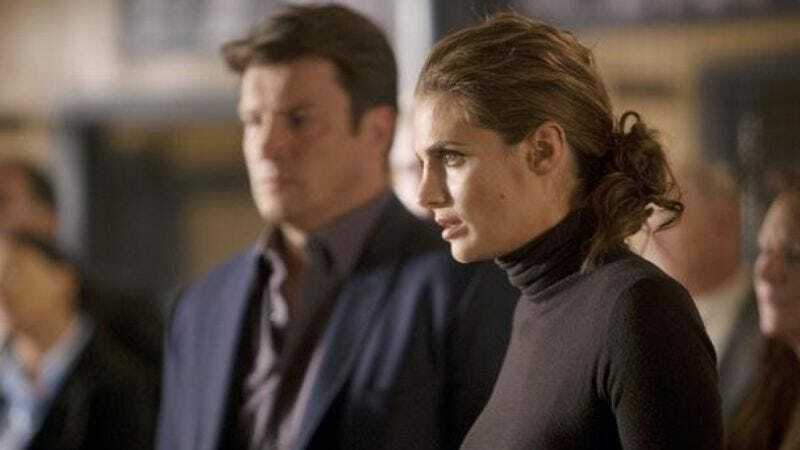 Castle and Beckett are obviously the heart of the show, but expanding the significance of other characters can only serve to help the show in the long run. It’s nice to see that recognized here. For all of the ways this episode was moving and for all of the things it did right, a few things could have been better. The idea of a killer hunting people who are in the happiest time of their lives is chilling in a way, but boiling it down to the simplest explanation of why that happiness is a target was banal and disappointing. The final setpiece on the school bus seemed clumsily plotted and edited, which undermined a bit of the authority the writers had given the sniper previously. And, as mentioned previously, Beckett’s ability to both manifest and resolve her PTSD in one episode was a bit beyond belief. Still, the force of Katic’s performance would be enough to carry a much weaker episode than this. And as to what this means for Beckett’s character? I’m as ready as she is to find out. The paper doll bit was a bit too writerly for me (do killers in real life always leave such nicely traceable clues to their next victims? ), but the moment when Castle pulled out the dolls to form a chain still sent a bit of a chill down my spine. Also unsettling: All of the precinct phones ringing at once just after Castle figures out the purpose of the paper dolls. This episode of Castle probably featured the least amount of actual Castle to date. Penny Johnson Jerald’s character continues to grate. The “captain as obstacle” is such a well-trod story, if you’re going to do it, you need to give it a bit of life. There is still no life to be found.